Steve Ballmer, Microsoft’s CEO, is obviously turning his focus to the power and relevance of cloud computing. 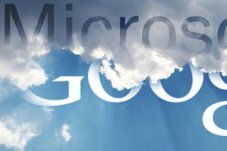 The future of the web is the ‘cloud’, and companies such as Microsoft and Google are making a mad dash to establish themselves as the ‘cloud’ leader. From: Steve BallmerToday, I spoke to a group of students and faculty at the University of Washington to discuss how cloud computing will change the way people and businesses use technology. My goal was to challenge people to look at the cloud more broadly and understand the multidimensional nature of the cloud transformation happening today. Other companies have defined the cloud in a narrow, one-dimensional way. Although these companies provide some interesting components, Microsoft is uniquely delivering on a wide range of cloud capabilities that bring increasingly more value to our customers. This view fuels our investments across the entire company, from datacenters to cloud platform technologies to cloud-based development tools and applications. Today, nearly every one of our products has, or is developing, features or services that support the cloud. As I said today, when it comes to the cloud, we are all in. We are all in across every product line we have and across every dimension of the cloud. Of course, this is not news to any of you. We have been making huge investments in the cloud for the past decade. Nearly five years ago, Ray’s “Services Disruption” memo provided the outline for what we needed to do as a company, and with the delivery of Windows Azure at the recent PDC, we have made huge strides in making this vision real. To keep our momentum, it is critical that every Microsoft employee works to deliver the full benefits of the cloud to our customers. Review your commitments to ensure you are landing our vision with customers and partners. Of course, there is more work to do. We have strong competitors. We need to be (and are) willing to change our business models to take advantage of the cloud. We must move at “cloud speed,” especially in our consumer offerings. And we need to be crystal clear about the value we provide to all our customers. To drive our message home even further, today you will see an ad campaign in the U.S. focused on our commercial and government businesses, a new website with consolidated content and case studies, and ongoing emphasis on the cloud from me and other members of the SLT in our upcoming speeches and presentations. We have an enormous opportunity in front of us. We have great products and services in the market today and a range of new ones on their way. All of our products make the cloud better, and the cloud makes our products better.